One of the hardest meals to wrap your head around while on the Autoimmune Paleo Protocol (or AIP Diet) is breakfast. You can't have eggs, and many of the other familiar foods like cereal or pancakes are either really hard to make or not encouraged. In this post I give you 10 AIP breakfast ideas to get your morning started. This is by no means a comprehensive list and there are many many other things you can eat, but these should get you started and out of that whole feeling of frustration and overwhelm that comes when you decide to tackle this healing diet. If you prefer to watch rather than read, here's my vlog where I talk about each of these 10 AIP breakfast ideas. If you'd rather read, skip ahead to read below! (1) Coconut Cream Parfaits – I shared these fun little parfaits a few posts ago and they are great for making ahead of time and taking with you if you need a portable option. You can customize them via tons of different flavors and toppings. Depending on how much gelatin you put in them they can either be really thick, like panna cotta, or thin, like yogurt. (2) Breakfast Soups – These are my favorite breakfast option while on AIP. They're easy to digest, can be made ahead of time, frozen if necessary, and easily thawed and reheated in the morning. Depending on what you put in them they can be quite nutrient dense and give you a good dose of vitamins and minerals for your day. Soups can be simple to make – don't overthink it. Just take some veggies like broccoli, cauliflower, beets, or even mixed greens, steam them until soft, then blend with some chicken or beef stock, sea salt, and some herbs or AIP-compliant spices. You can use pretty much any veggie or veggie combo. 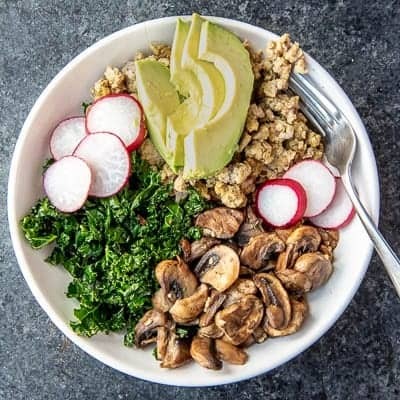 (3) A nourishing bowl of different veggies and meats – An example is this bowl below of sauteed mushrooms, kale, a chicken sausage, avocado, and radishes. 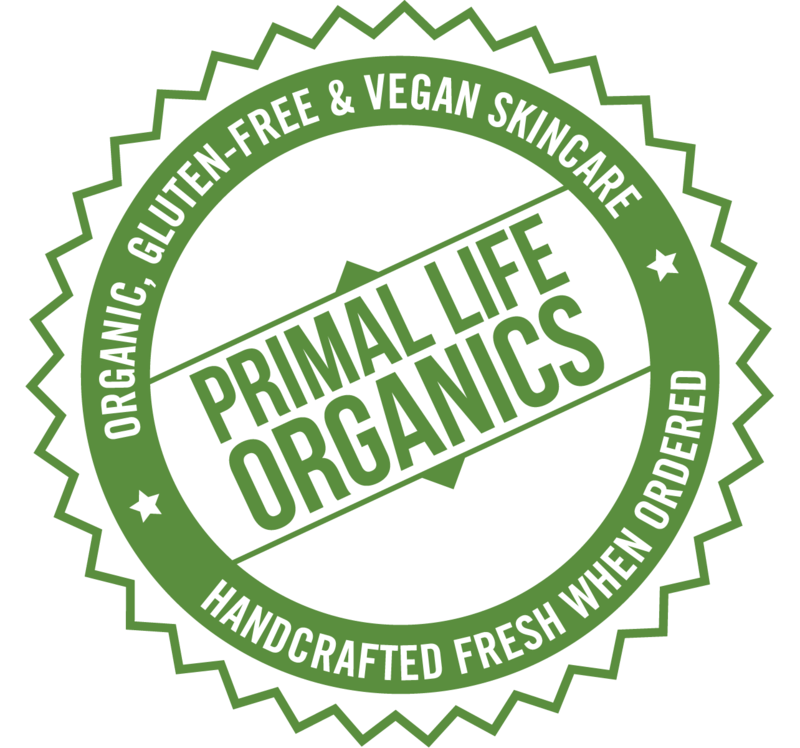 Tons of different flavors, and a well-rounded bowl of nutrients to keep you full. You can find the recipe for this Nourishing AIP Breakfast Bowl here. (4) A porridge – a good one I like is steamed cauliflower and apple with a dash of cinnamon, sea salt, and a scoop of collagen (this is the one I like) that has been blended until creamy. You can add so many different toppings on top of this, and it's a good one to make ahead of time and just reheat. (5) Sweet Potato Bowl – I shared how to make this delicious bowl that can be made ahead of time on my vlog a bit ago. It's essentially mashed sweet potato, but when you add some elements like collagen, spices like cinnamon and mace, and fun toppings it becomes so much more. (6) Pancake Bowl – this is not just a stack of pancakes on a plate with maple syrup, but rather a plate or bowl with other elements to round it out a bit and not set your blood sugar on a roller coaster for the day. 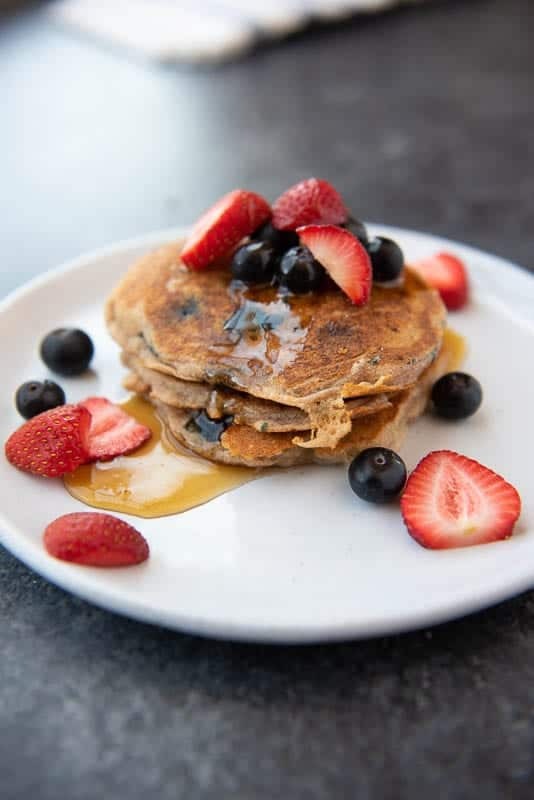 Items to eat with pancakes could be breakfast sausage, coconut milk yogurt or even some of the coconut parfaits from idea # 1 above, avocado, berries, tigernuts, etc. (7) Leftovers! This one is one of the smartest ideas of what to eat for breakfast while on AIP – and the most nutritious. Instead of thinking of breakfast as this meal that has to have a totally different kind of food than everything else, you can just eat leftovers from dinner! Not only is it easy, but it's also usually easy to reheat for busy mornings. Even if you don't have a full meal of leftovers, keep small portions of leftovers and mix them all together to form a meal. Or mix some leftovers with one of the other ideas in this post. (8) Breakfast Hash – I think when most people think of a hash they think of potatoes with a fried egg on top, but it does not need to mean that. Instead, think of a hash as a mixture of diced veggies that can be served for breakfast! You can put in any AIP-compliant veggies and fruits, like diced sweet potatoes, turnips, parsnips, butternut squash, fennel, apples, onions, etc – the sky's the limit! Just simply dice and then either cook in a pan or in an oven until tender. Add some breakfast sausage, fresh greens, or avocado to complete the meal! (9) Sweet Potato Toast – These are such a fun idea because you can easily make them either sweet or savory. Either peel and thinly slice a sweet potato into 1/4 inch slices and then cook in the oven at around 425 F for 15-20 min (or until soft), or in a toaster on the longest setting for a few rounds. Then top with whatever you want. Sweet potato toast is also a great meal to serve when you have guests or families because you can make the toast and then have assorted toppings that satisfy everyone. You can make some scrambled or fried eggs and other things that they can have and you stick to your AIP-compliant ingredients. (10) Smoothies – The last idea is smoothies. They aren't particularly smiled upon as the BEST option because our bodies react differently to chewing versus drinking our foods, but I know many rely on these as their fast, portable option. Note: It's best if you can have an item to chew, like breakfast sausage or slice of ham, along with your smoothie so that the proper digestive enzymes and hormonal releases (things like insulin, etc) all work properly. If you want a smoothie while on AIP, opt for more veggie-heavy vs. fruit-heavy ones, add some fat like avocado or MCT or coconut oils, and add some protein via a scoop of collagen. Otherwise, many smoothie recipes you find usually can be converted pretty easily to be AIP-compliant. 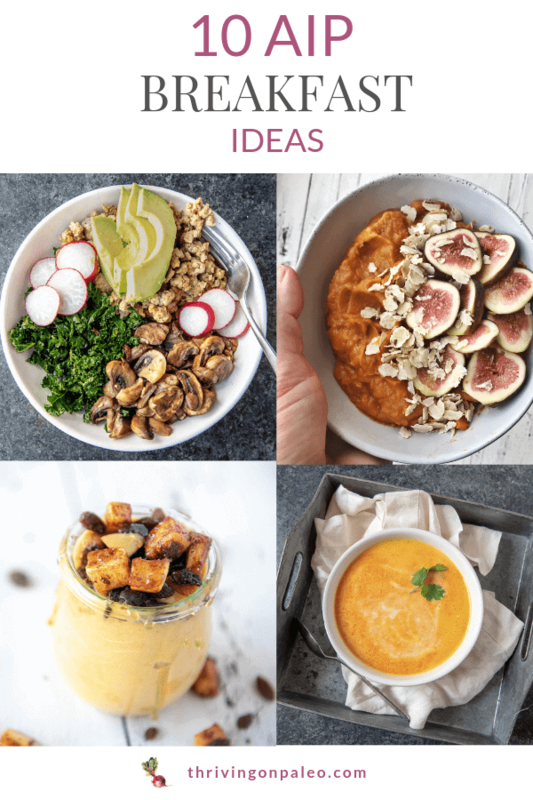 Hopefully this list gets you started and out of being overwhelmed about what you can eat while on Autoimmune Paleo! 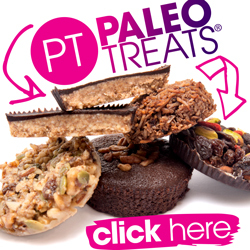 Have you joined my Paleo freebie library yet? 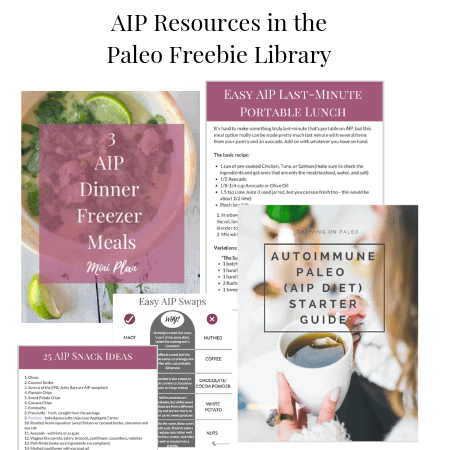 There are a bunch of AIP-only resources in it – including a mini freezer meal plan, swaps list, snack ideas, and starter guide! Get the password here. 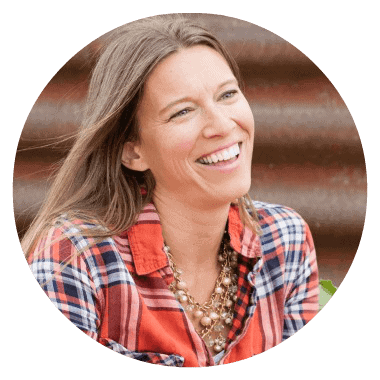 Want more ideas and all sorts of help on your AIP journey? Check out my AIP-only membership site, The Autoimmune Collective! 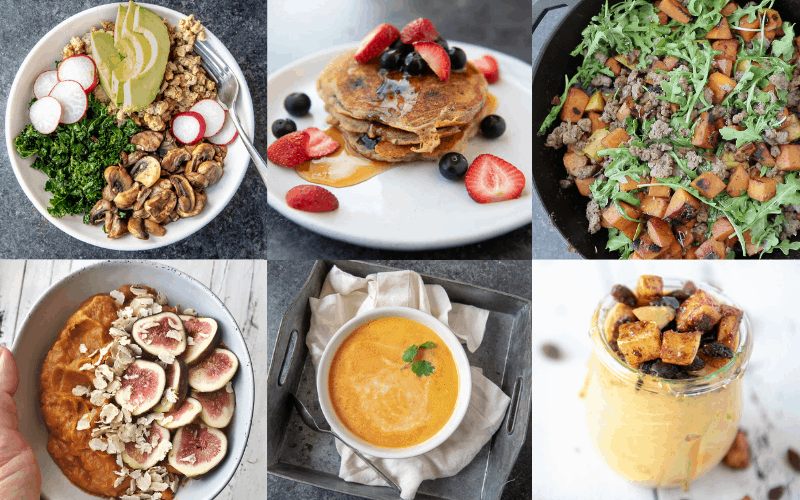 Meal plans, recipes, a “How to do AIP” course, and more! These are great ideas, thank you!! Thanks so much for taking the time to let me know!